I do not see myself as a risk taker. Really, I play it safe, I follow the rules – for the most part – except when driving, then I tend to speed a little. But, when I lost my brother in 2009, it rocked my world. He was on a motorcycle. It wasn’t his fault. He LOVED motorcycles. I wondered what was going through his mind that day, before the accident. It was in October, it was sunny, it was early afternoon, it was crisp, it was beautiful, a most glorious day. Afterwards, I wanted to be close to him. To see if he would speak to me, let me know his presence somehow. So, I took a motorcycle course, learned to ride. Bought a Harley, a big, heavy Harley. I dropped her 11 times before I figured out how to keep her upright. I was scared, I was petrified, I was certifiable. 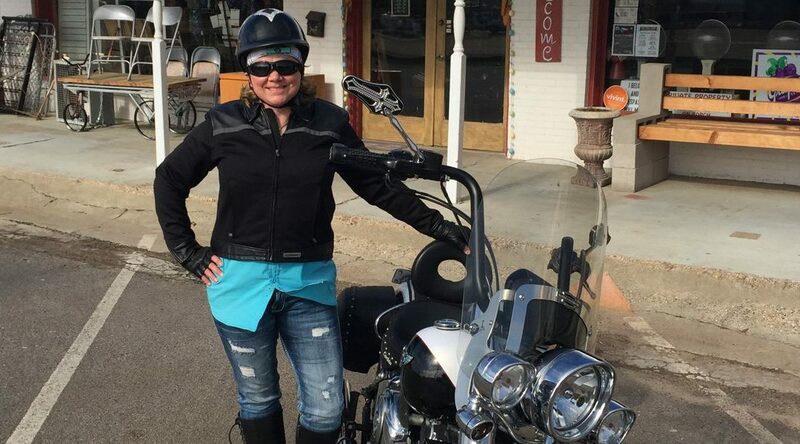 I told myself, I wasn’t the first woman to learn to ride a motorcycle. I could do this. I would do this. I did it! I see what he was feeling that day, why he chose to ride. God knows our number of steps, he knows what we are going to do before we do it. I believe this was the path for me at the time. I don’t ride much, but when I do, I smile. I feel the wind, I see the sky, the open road, I most certainly feel my brothers presence.